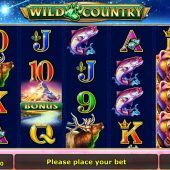 Wild Country slot takes us into North America for a look at its wildlife and therefore you can expect the same range of animals you've seen on slots such as Blueprint's Buffalo Rising, Aristocrat's Buffalo and Play'n Go's Wild North. The prairie at night forms the backdrop and we have the trademark Novo trotting noises as the reels stop punctuated by some mighty roaring if you see the Grizzly Bear appear in any wins. What perils do these aggressive looking animals hold for our bankroll though? 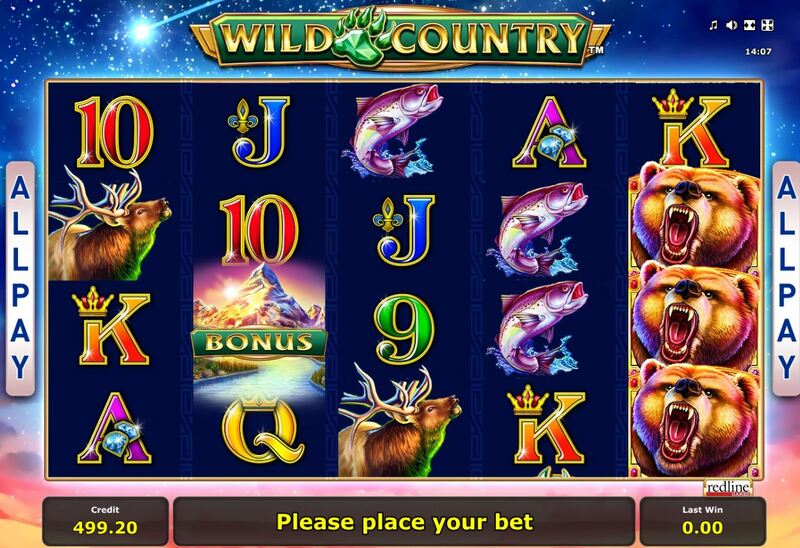 We have 1024 on Wild Country slot which you will know means 5 reels of 4 rows apiece. Symbols appear individually bar the Grizzly Bear although 2 can appear on the reel at once, with 3 Grizzlies possible on any reel. That's because he's the best 5-of-a-kind pay at 150 coins which is nearly 4 times our 40-coin bet. The Cougar and Eagle will also pay 150 coins, Moose and Salmon 100 with Ace down to Jack paying 50 and 10 or 9 40 coins for a full way. You will see green paw print Wilds singly on the centre 3 reels and Mountain scatters on all. If the scatter triggers don't tell you what game you're really playing, then the the Wilds will, but let's see - 3 scatters trigger 8 free games, 4 will award 15 and 5 is the best at 20. You can retrigger them but just 2 in the bonus award 5 extra spins too. Now you'll get the next bit if you haven't guessed correctly already, as any Wild in the bonus counting in a win will reveal either a 2x or 3x multiplier therefore you can earn up to 27x on your wins. Enough said.